The post I read today resonated with me and raised a question. I have been so immersed in the day to day of school life I lose sight of what my strengths/weaknesses are. I want to develop myself as a leader. Where do I start? How do I determine what needs improving? What strategies would you suggest. Your use of “myself” hints at ownership and humility. You aren’t simply looking for techniques or strategies. Where do you start your development journey? You already started. You have enough self-awareness to see that urgencies might be a distraction. You read leadership blogs. You wrote an email to me. In short, you’re on your personal development journey right now. Regarding your strengths and weaknesses. Turn your interest toward others at work, home, or with friends. What strengths and weaknesses do you see in them. Watch for high energy moments, behaviors that come naturally, and ways they add the most value. Discuss what you see with them. Invite their feedback regarding your strengths and weaknesses. Others help us see ourselves. Early in my career, people would say, “You make me think.” I didn’t understand it because I wasn’t trying to make them think. Today, as a leadership coach, I give people opportunity to think in new ways. Learn to see yourself through the eyes of others. Read, Strength Finder 2.0. The book includes a strengths assessment. How do you determine what needs improving. I encourage you to shift your thinking from improving. Think maximizing. You go further maximizing your strengths than improving weaknesses. Some weaknesses might hold you back. Analytical people might be poor decision-makers, for example. In those cases, improvement is in order. Just realize that you may never be very capable in those areas. Blindspots are the worst form of weakness. What do others say about your weaknesses. For example. when people say, “You’re just like your mother,” (Insert any person) and it irritates you, believe them. Most of us are mostly average. 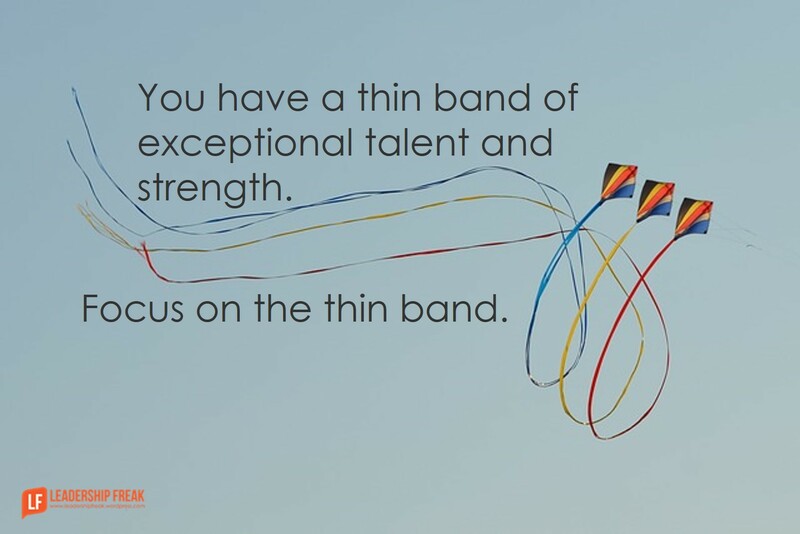 You have a thin band of exceptional talent and strength. Focus on the thin band. Write a personal definition of leadership. Clarify your top five values. Use action words, not nouns. Practice self-awareness. Be your own observer through the day. What impact are you having on others? What gives you energy? Incorporate personal development into day to day activities. Choose a leadership quality and behavior that you can put into practice while doing your current job. Connect with people who share your passion. Respect the impact of the people in your inner circle. Stretch yourself. Take on new assignments. Volunteer. Include others when you stretch yourself. Leadership is about others. All leaders gradually shift from making individual contributions to getting things done through and with others. Learn how to stay curious and ask forward-facing questions. Be sure to include, “What’s next?” Curiosity about the past seems natural and easy. Leaderly curiosity is about the future. Get a coach and connect with mentors. What suggestions might you offer Immersed? What has helped you develop as a leader? Hi Dan, another excellent read, thanks. Before we develop our leadership skill should we know who or what we are to lead? Marvelous, Dan, and definitely reaffirming. We all need to be reminded to read (to find the right stuff) so we can read (the right stuff), always remembering: “I read, I do, I become!” (http://wp.me/p2k440-bl). Thanks for continuing insights and challenges. Thanks Jim. “I read, I do, I become.” … Love it. Thanks for sharing your insights. I read your reasons for reading. Thanks for your insights. Dan great post. For a young person coming up, I think a couple of your suggestions are critical. Read. Not just traditional business books, like Waterman’s The Renewal Factor and the classic Servant Leadership by Greenleaf but books like Tinker, Tailor, Soldier, Spy by John LeCarre which deal with organizations and people trying to work in complex situations. Second watch and ask questions of your Bosses, Mentors etc to understand how and why they make certain decisions. I was lucky in my early work life to have a Boss who included me in all kinds of meetings. That is how you learn what is not in the college courses! Thanks Brad. It’s great that you expand the idea of reading beyond traditional business books. I’ve found the classics, poetry, and the Bible to be of amazing value. As to your second point. The power of being included in meetings or other activities that are “above our pay grade” accelerate the journey. We’d all be wiser to leverage this cost effective strategy for developing leaders. I believe you have to understand what kind of Leader do you want to be? Who do you want to lead? What are you as a leader going to do for others? What is your purpose in being a leader? Where do you want your leadership to take you? All the responses today are excellent as usual by the responders, for some reason I came up with questions to ask ourselves on one’s journey. Happy Sunday morning Dan! Great question from your reader, and a great response. I often get asked how do I develop myself. The answer is illusive because it is small steps taken each day that make it happen. Through books, personal reflection, training, interaction with those also on the journey, and a healthy level of self awareness, a person can travel down this road and look back with amazement about the progress made. It’s a great journey that never ends, and involves many ups and downs. And most importantly, it’s a journey that is best taken with others.